The Creole Pig was a breed of pig indigenous to the Caribbean nation of Haiti. Creole pigs are well adapted to the rugged terrain and sparse vegetation of Haiti. 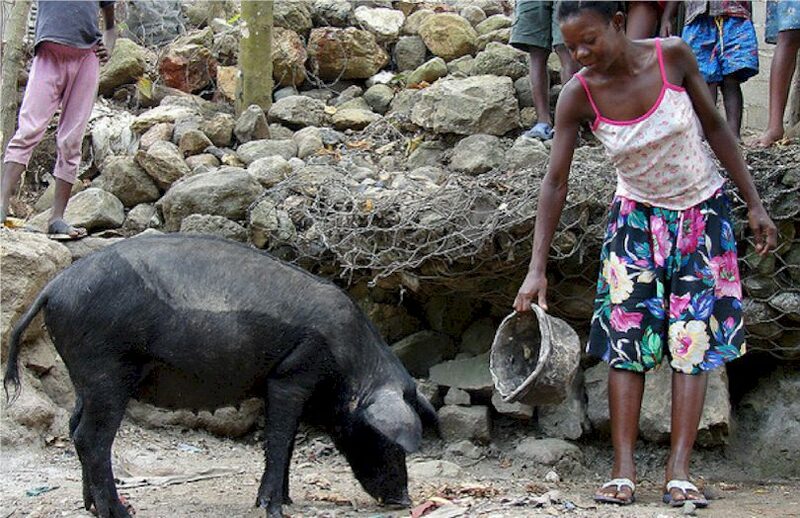 The pigs resilience allowed Haitian peasants to raise these pigs with little resources. The peasants characterized their pigs as never getting sick. For generations, the Haitian Creole pig had been a poor Haitian familys most important economic asset. Rugged foragers that coped well in Haiti’s tropical climate, Creole pigs were cheap and easy for peasant families to raise. Beyond meat, the pigs real significance lay in their role as a peasants savings bank an asset that could easily be tapped into when cash was needed. These dark black pigs were known for their boisterous nature and have been incorporated into elements of vodou folklore and the oral history of the Haitian revolution. In the early 1980s an outbreak of African swine fever hit the neighboring Dominican Republic. Officials feared the flu might spread throughout Haiti and to the United States, where it could devastate the pork industry. The United States Agency for International Development, known as USAID, and the Haitian government led a campaign, known by the French acronym PEPPADEP, to exterminate Haitis pigs. Farmers who were compensated received pigs imported from the United States that were far more vulnerable to Haiti's environment and expensive to keep. In the year following the slaughter, levels of enrollment in schools were dramatically lower throughout Haitis countryside. In the Haitian peasant community, the governments eradication and repopulation program was highly criticized. The peasants protested that they were not fairly compensated for their pigs and that the breed of pigs imported from the United States to replace the hardy Creole pigs was unsuitable for the Haitian environment and economy. In recent years, Haitian and French agronomists have bred a new variety of pig similar to Haitis Creole pig. An effort to repopulate Haiti with these pigs is underway.